AmBisome is indicated for the following: (1) empirical therapy for presumed fungal infection in febrile, neutropenic patients; (2) treatment of Cryptococcal Meningitis in HIV-infected patients; (3) treatment of patients with Aspergillus species, Candida species and/or Cryptococcus species infections refractory to amphotericin B deoxycholate, or in patients where renal impairment or unacceptable toxicity precludes the use of amphotericin B deoxycholate; (4) treatment of visceral leishmaniasis; in immunocompromised patients with visceral leishmaniasis treated with AmBisome, relapse rates were high following initial clearance of parasites. Amphotericin B, the active ingredient of AmBisome, acts by binding to the sterol component, ergosterol, of the cell membrane of susceptible fungi. It forms transmembrane channels leading to alterations in cell permeability through which monovalent ions (Na+, K+, H+, and Cl-) leak out of the cell, resulting in cell death. While amphotericin B has a higher affinity for the ergosterol component of the fungal cell membrane, it can also bind to the cholesterol component of the mammalian cell, leading to cytotoxicity. AmBisome, the liposomal preparation of amphotericin B, has been shown to penetrate the cell wall of both extracellular and intracellular forms of susceptible fungi. Adapted by permission from Macmillan Publishers Ltd: Bone Marrow Transplantation. Adler-Moore J. AmBisome targeting to fungal infections. 1994;14:S3-S7, copyright 1994. 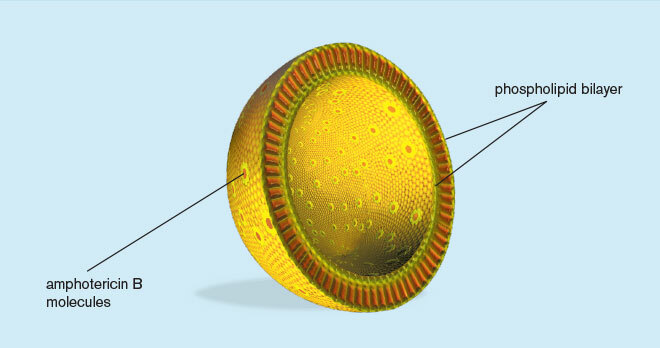 A. fumigatus incubated with gold-labeled liposomes: (a) without AmBisome, showing lipid from the liposomes in association with the surface of the fungal cell wall. 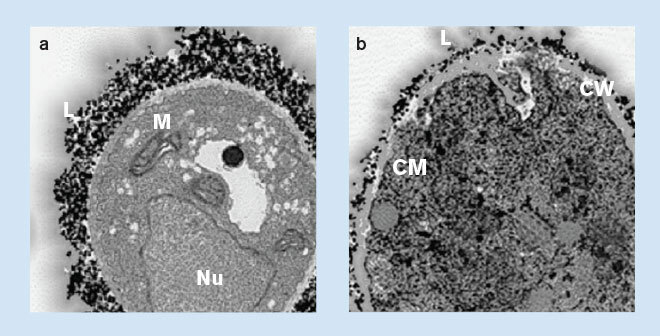 Nu=nucleus; L=gold-labeled lipid of liposomes; M=mitochondria. (b) with AmBisome, showing lipid from the liposomes in association with the fungal cell wall, penetrating through the cell wall, and lipid accumulating in the cytoplasm. CW=cell wall; CM=cell membrane. In vitro data do not necessarily correlate to clinical outcomes. AmBisome is contraindicated in those patients who have demonstrated or have a known hypersensitivity to amphotericin B deoxycholate or any other constituents of the product, unless benefit of therapy outweighs the risk. Anaphylaxis has been reported with amphotericin B–containing drugs, including AmBisome. If a severe reaction occurs, the AmBisome infusion should be immediately discontinued and the patient should not receive further infusions of AmBisome. General: During the initial dosing period, patients should be under close observation. AmBisome has been shown to be significantly less toxic than amphotericin B deoxycholate; however, adverse events may still occur. Laboratory Tests: Patient management should include laboratory evaluation of renal, hepatic, and hematopoietic function, and serum electrolytes (magnesium and potassium). Drug-Laboratory Interactions: Serum Phosphate false elevation. False elevations of serum phosphate may occur when samples from patients receiving AmBisome are analyzed using the PHOSm assay. The commonly reported adverse reactions across all studies with an incidence of >20% with AmBisome include: rash, hyperglycemia, hypokalemia, hypomagnesemia, diarrhea, nausea, vomiting, anemia, increased alkaline phosphatase, increased blood urea nitrogen, chills, insomnia, increased creatinine, and dyspnea. Infusion related reactions include chills/rigors, fever, nausea, vomiting, hypertension, tachycardia, dyspnea, and hypoxia. There were a few reports of flushing, back pain with or without chest tightness, and chest pain associated with AmBisome administration; on occasion this has been severe. Where these symptoms were noted, reaction developed within a few minutes after the start of infusion and disappeared rapidly when the infusion was stopped. These symptoms do not occur with every dose and usually do not recur on subsequent administrations when the infusion rate is slowed. References: 1. AmBisome® [package insert]. Northbrook, IL: Astellas Pharma US, Inc. 2. Adler-Moore J. AmBisome targeting to fungal infections. Bone Marrow Trans. 1994;14(suppl 5):S3-S7. AmBisome® is a registered trademark of Gilead Sciences, Inc.
Astellas® and the flying star logo are registered trademarks of Astellas Pharma Inc.